When we’re young, nothing beats that magical feeling of the Christmas period. It is, without doubt, the best time of year. Most of us get so excited that we can’t even sleep! But, as the years go by, that magic disappears a little. This usually starts with the Santa scandal (don’t worry; we won’t say it out loud), and gets worse once we move out of home and break away from tradition. The day which once meant so much to us becomes another day of the year. Some of us even start to resent the hassle. But, then, you have children of your own, and the magic comes back tenfold. Only now, they’re the focus. Every Christmas you experience after becoming a parent is about your kids. Any efforts you go to are to ensure they have the best day possible. And, most of the time, you can be sure they will. The good news is, you don’t even have to wait until your little one knows what Christmas is about to make a fuss of them. In fact, their first Christmas is by far the most magical. They may not remember it, but you certainly will. So, if you have a first Christmas coming up in your family, it’s essential you make it as special as possible. And, here are a few of the ways how. If you think back to Christmas as a child, it’s likely that you remember your family’s holiday traditions best. These are, ultimately, what makes the day so special. And, the best thing about them is that they never change. Once a tradition is in place, it stays. You may well add others along the way, but these constants stand to make the day what it is. And, your baby’s first year is the perfect time to start. These traditions are crucial, because they’ll be with your child from the start. As such, they’re ones which they’re most likely to take into adulthood. No pressure, but you might want to think about these carefully before the day. Traditions are often simple things. Consider what time you get up to open presents, or what you have on in the background as you do. Some families insist on chatting, while others can’t imagine the routine without a particular movie in the background. Equally, some families wake while it’s still dark, yet other’s enjoy a lie in and open presents after lunch. Think about what would suit your family best, and make sure to stick to this in coming years! You could also develop traditions about the food you eat, or a specific cake you make for the day. While your little one can’t join in yet, they’re sure to embrace such traditions in their later years. And, you can be sure it will all add to that touch of magic! Given that this is a special Christmas, it’s also worth finding ways to mark the occasion. By doing this, you can also ensure that your little one will be able to look back on the day, even if they can’t remember it. On a fundamental level, taking pictures throughout the day is a must. Who doesn’t want a photo of their first Christmas? This would definitely be one to frame! Think, too, about buying small things to remember the day. There are many personalised options out there. A bauble with the date and your baby’s name on it would look amazing. You could even buy a special ‘first Christmas’ outfit, like those found in the Zoey’s Personalized Gifts holiday catalog. This would be a keepsake you could hand down to your child when they reach eighteen. As well as being a fantastic way to embarrass them, you can be sure they’ll appreciate the gesture. If you fancy taking things further, you could even make them a first year stocking. This could become another of those traditions. They could use this for years to come, and always remember the effort Mom went to for their first year! Many of us have a habit of going over the top for Christmas. ‘Tis the season for giving, after all. 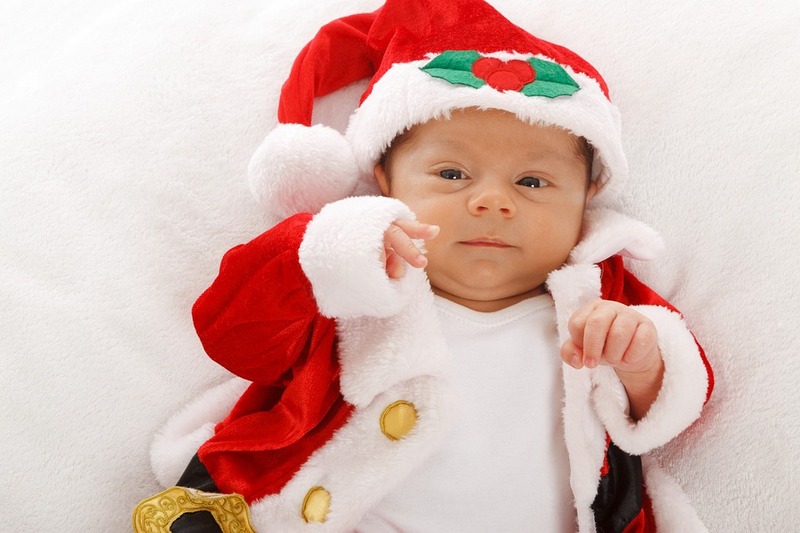 And, when a baby has their first Christmas, it isn’t unusual for people to splash out on all sorts of gifts. As parents, you’ll likely fall into the same trap. The sad fact is, though, that most of these gifts are unnecessary. In fact, the majority of them will end up in the trash by this time next year. Such is the nature of baby toys. On top of which, your child won’t know they’re getting presents. They probably won’t care much, either. Most babies spend more time playing with the wrapping paper than the presents. With this in mind, it’s worth focusing on more traditional Christmas values. By all means, get your baby a few presents. But cap the amount you spend, and ask everyone else to do the same. If they insist on spending more, you could ask that they give to charity in your baby’s name, or do the same yourself. This would be a much more giving and valuable way to spend. In place of surrounding yourself with useless toys, make an effort to surround yourself with loved ones. This is another of those Christmas values we should all return to more often. And, for a first Christmas, it’s a fantastic way to spread the love. This way, you all get to share this special occasion together. The grandparents, aunts, and uncles are sure to appreciate this chance to spend time with your little one. It’s likely you’ll all enjoy each other’s company, too! You could get stuck into games after dinner, and fall asleep together in front of the television. Your baby might not understand yet, but in a few years, they’ll be doing the same thing. Until then, you’ll just have to try and have fun in place of them!